I just realized that I didn't post this earlier. As a Sephora shopper I was invited to the grand opening of the Emeryville location. 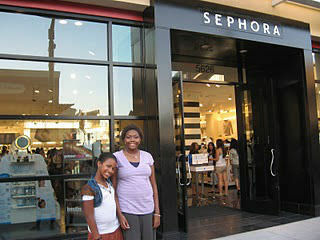 (It opened July 5th) My girlfriend Asha and I took our daughters for the ribbon cutting and grand opening party. There were exquisite chocolates from Cocoabella Chocolates, (San Francisco) a DJ, and extra staff available to answer questions and give makeovers. It was the ultimate girl night!